Let Teddy help teach you seamless knitting techniques used in shaping 3-dimensional forms. Techniques used and described in making this small adorable teddy bear include Double Knitting, Kitchener Stitch, Double Knit Bind Off, Knitting in the Round, and Circular Short Rows. This is a great project to team up with orphan balls of yarn. 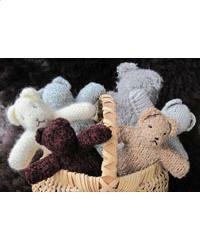 Choose smooth, textured or fuzzy yarns to give each teddy it's own personality as you prefer. Of course, you might not be able to decide and will end up with a family as we did here! Project Size: 8" to 10"